You are at:Home»STEM»Local STEM Leaders»K-12 STEM Symposium Awards: Have You Sent in Your Nomination Yet? K-12 STEM Symposium Awards: Have You Sent in Your Nomination Yet? There’s still time to submit nominations for awards to be presented at the March 30 K-12 STEM Symposium. 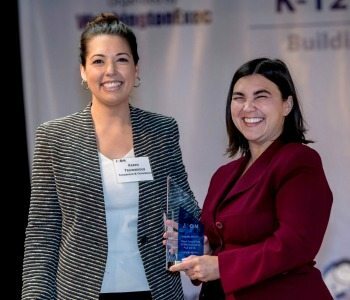 Winners are selected by the WashingtonExec STEM Council for not only having achieved great levels of success in the STEM fields but also for having a sense of responsibility to nurture and inspire younger minds through service, mentorship and outreach. The awards program recognizes and honors businesses and individuals for their efforts to develop and/or promote K-12 science and technology programs that add value to the local community and inspire the next-generation STEM leaders. The STEM Executive winner celebrates the duties performed by executives outside of the job description; nominees range from a variety of backgrounds and expertise. For the STEM Rising Star award, nominators are asked to discuss K-12 science and technology programs that add value to their local community and inspire the next generation of STEM leaders. To qualify, nominators must answer two prompts of 250 words and be able to attend the March 30 awards ceremony. Winners will be recognized following panel discussions at the event. They will also have a few minutes to give remarks. To nominate individuals, click here and follow the instructions. Pinnacle Award STEM Advocate winner: Joyce Abbey, SAIC employee who works to promote the importance of aerospace and NASA in her Houston, Texas, community. Abbey leads several K-12 STEM initiatives, including with the Clear Creek Education Foundation, “where she uses her leadership position to weave the story and contributions of aerospace into educational initiatives in the district,” her nominator said. Most Inspiring STEM Executive winner: Ann Swanson of CGI Federal. Swanson develops, nurtures and guides the STEM workforce of tomorrow. The program she leads served over 450 underrepresented students in STEM. STEM Rising Star winner: Kavya Kopparapu, then senior at Thomas Jefferson High School for Science and Technology. Kavya garnered national attention for Eyeagnosis, a smartphone app she created to automatically screen for diabetic retinopathy. STEM Rising Star winner: Kirthi Kumar, then a sophomore at Thomas Jefferson High School for Science and Technology. She is the founder and CEO of SheSoft, an organization aimed at bridging the gender gap in STEM. STEM Nonprofit winner: Brian Moran accepted the award on behalf of Boolean Girl, which he co-founded along with Ingrid Sanden and Sarah Eastman. Boolean Girl aims to narrow the gender gap in STEM through education and exposure to computer science and engineering. STEM-Supporting Business winner: Northrop Grumman, accepted by Karen Goetz, manager of corporate citizenship. In 2017, Northrop Grumman and the Northrop Grumman Foundation contributed more than $20.4 million to diverse STEM-related groups such as the Air Force Association and CyberPatriot, the REC Foundation (VEX Robotics), National Science Teachers Association, Great Minds in Stem (Viva Technology), EarthEcho International’s Expeditions and the Space Camp program. STEM-Supporting Business winner: Business Women’s Giving Circle accepted by Leigh Chowdhar. Launched by the Community Foundation for Northern Virginia, the program positively impacted more than 1,300 girls and young women in the community. BWGC has awarded $178,000 to organizations providing experiences in STEM leadership and entrepreneurship.